After steadily rolling out the bulk of their 2018 lineup earlier in the month, organizers behind NXNE have made a few more key additions before next month's event. Tinashe joins the fest's crop of headliners that already included Chvrches, Jazz Cartier, Azealia Banks, Lights and Big Freedia. Other additions to the fest's programming at Yonge-Dundas Square include New Swears, Bueller, Sneaks, A Is for Arrows and more. The festival had previously announced the inclusion of U.S. Girls, Cadence Weapon, Sean Leon, Torres and more. 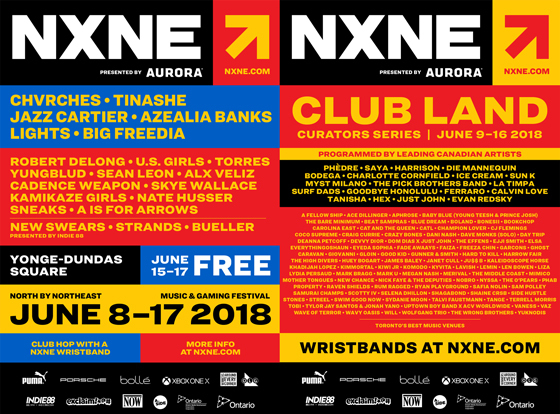 NXNE organizers have also beefed up their crop of Club Land curators, adding Odd Future's Taco, Toronto rap duo Hard to Kill, electro-glam artist Nyssa and more to the list of artists that will curate shows for festivalgoers. They join a lineup of curators that already included Leah Fay and Peter Dreimanis (July Talk), K-os, Jasmyn Burke (Weaves), Odario Williams (Grand Analog), Katie Monks (Dilly Dally), Cadence Weapon, Jim Cuddy (Blue Rodeo), Cone McCaslin (Sum 41), Terra Lightfoot, Ian Blurton (Change of Heart), Moe Berg (Pursuit of Happiness), Ralph, the Elwins, Dan Burke and more. NXNE 2018 is set to run from June 8 to 17. Club Land programming wristbands are currently on sale for $29 and can be found here. For full information and festival updates, check out the official NXNE website. Watch a teaser for the upcoming fest below.